In this webinar recording, Michael Bowlan explains how GOES-R/16 can help improve forecasts of severe storms and provide forecasters with real-time information about lightning, flooding potential and other hazards. The high-resolution Advanced Baseline Imager (ABI) data can indicate whether thunderstorm updrafts are gathering strength or weakening, helping aid forecasters in making warning decisions. The ABI can also aid in identifying storms and convective complexes that have stalled or are “training”, which can signal a flood risk and help forecasters issue flood or flash flood warnings sooner. Lightning data provided by the Geostationary Lightning Mapper (GLM) will help forecasters and fire analysts identify areas prone to wildfires sparked by lightning, as well as give insight into a storm’s severe potential. The power point was hard to hear. Good lesson for a quick overview on GOES 16 products and how they are an improvement over earlier satellite products. Somewhat monotonous, but it covers the requisite information. 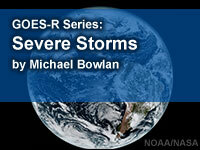 Valuable lesson to learn more about how the GOES-R satellites will help with severe weather analysis and prediction. I thought this class was very informative . Some neat tips, kind of slow (boring). I recommend this training to everyone interested in Weather! image loops are helpful, as well as the quizzing during the lecture.